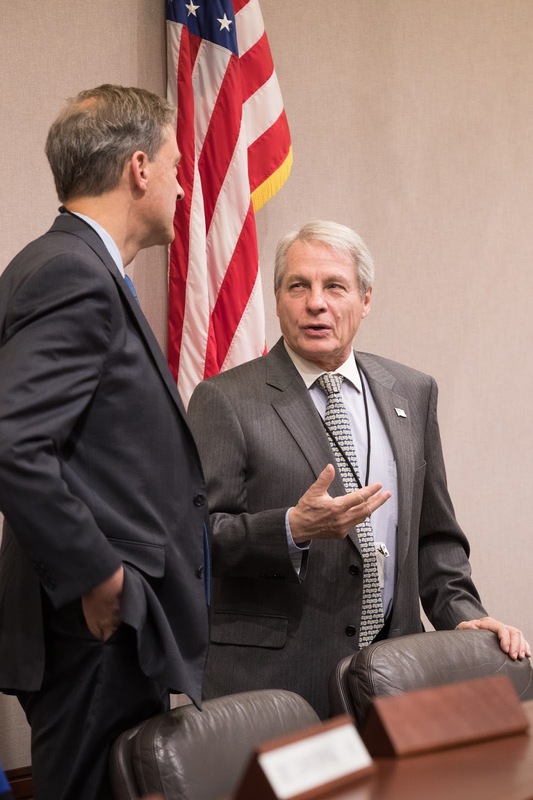 Sen. Len Suzio (right) speaks with Norwalk Rep. Fred Wilms (left) prior to the first 2017 meeting of the Connecticut General Assembly’s Transportation Committee. Suzio serves as Vice-Chair of the legislative panel, which has cognizance of all matters relating to the Connecticut Department of Transportation and the Department of Motor Vehicles. Suzio encouraged area residents to contact him with concerns related to the DOT, DMV, or any other issue at Len.Suzio@cga.ct.gov or at 800 842-1421. Among Suzio’s priorities is de-funding the study of a potential Connecticut Mileage Tax – a potential tax on every mile Connecticut residents drive. Sign up for Suzio’s State Capitol updates at: www.SenatorSuzio.com . Suzio represents Cheshire, Meriden, Middlefield, Middletown, and Rockfall.